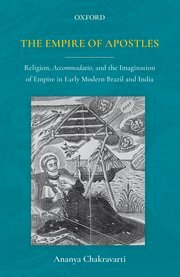 Ananya Chakravarti has just published The Empire of Apostles: Religion, Accommodatio and The Imagination of Empire in Modern Brazil and India with Oxford University Press. Among the Jesuit subjects in The Empire of Apostles are José de Anchieta, Thomas Stephens, António Vieira, and Baltasar da Costa. The book’s table of contents appears below.More information is available at Oxford University Press.